You’ve never played a game like this one, combining the magical experience of an RPG with the strategy of a puzzle game. You are Chouchou, heir of the Sacred Rooster Dynasty. Your quest is to travel across the Holy Mountain and free the Sacred Animals from the dark spell cast upon them by the mysterious Evil Master. To achieve your goal, you will have to gain experience and unlock the best weapons, by finishing as many objectives as possible. But victory won’t come so easily! 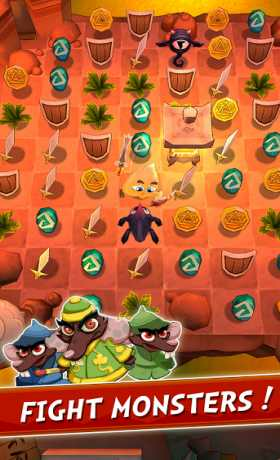 You will need courage and dexterity to align resources on your path, granting you more strength, defense and magic. And you might even find a few treasures on your path … who knows? -ALIGN swords, shields and jade crystals to acquire more power. 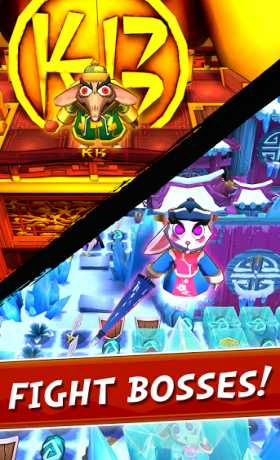 -Achieve super COMBOS and become Ultimate Chouchou! 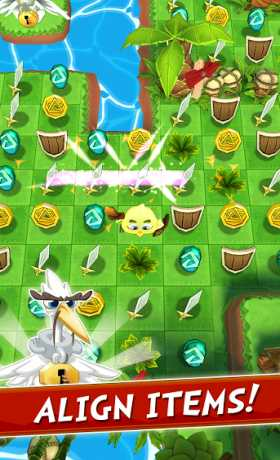 -FIGHT many enemies and the legendary bosses that will stand in your way. -INCREASE YOUR LEVEL by collecting XP. -GET THE BEST EQUIPMENT using the gold coins and XP you will have won along the way. -Discover all the hidden CHESTS.